First impressions matter when it comes to a business. This is why it is so important to keep your facility’s windows clean, especially if they are display windows. You can do a lot by having your employees keep finger prints off the door, but to truly get the sparkle and clarity that impresses, you need to turn to our professional window washing crews. Let Rozalado handle your entire commercial window washing needs. We provide competitive priced solutions to your high maintenance costs with our professional window cleaning services. We specialize in commercial window cleaning. We offer our professional services to office buildings, schools, retail, residential apartment buildings, restaurants, and medical clinics. Our service is prompt and reliable and we guarantee your satisfaction. The inside and the outside of one window panel count as one window. Each screen counts as one screen. 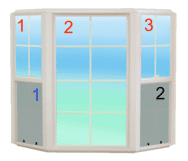 In this image example, a bay window is three window units and has 2 screens. We will be happy to provide a quote for you. Talk to us about routine window cleaning for your business. Contact us today about your window cleaning needs. We offer unparalleled service using the highest quality equipment, cleaners. We have experienced and friendly staff on hand year round to help you protect your investments. Our promise is a courteous and professional experience from initial meeting to completion of project. Most importantly we are offering this at an affordable price for all of our valued clients. We pride ourselves on taking the time to educate and train our technicians in numerous pressure washing programs and hands on training courses to ensure that you are getting a professional technician on each and every job. Please be careful when you hire someone to pressure wash if they are not knowledgeable in the work they are to be completing. We have done extensive amounts of research on the best equipment, best chemicals, and the best techniques for all kinds of cleaning and restoration projects. This dedication to the industry puts us in a small elite group of power/pressure washing companies in the Chicago land area.